Section 137-J:33 of the New Hampshire statutes provides that residents with a Do Not Resuscitate order issued by their physician may wear an identification bracelet or pendant to alert Emergency Medical personnel in the event of a cardiac or respiratory arrest. The regulation stipulates that the identifier must have the words New Hampshire Do Not Resuscitate on the front, and must include the person's name and date of birth in numerical form, which we engrave on the back. It also stipulates that we cannot issue the Do Not Resuscitate identifier until we have received a copy of the individual's Do Not Resuscitate order. All front and backside engraving is included in the price shown, and there is no recurring annual fee. 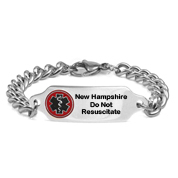 To order by mail, first download the New Hampshire Do Not Resuscitate bracelet order form by clicking on New Hampshire Do Not Resuscitate Bracelet Mail Order Form. You can either scan your Do Not Resuscitate order and send it to us by email (CustomerService@StickyJ.com), or Fax it to us at 727-490-5446, or mail it to: Customer Service, StickyJ Medical ID – DNR, 10801 Endeavour Way Unit B, Seminole, FL 33777. If you have any questions, please call us at 727-823-9500.